You are here: Home / Home - Featured / Do Judges work a full 40 hour work week? Do Judges work a full 40 hour work week? Our Nevada legislators will be receiving Assembly Bill 43 to hire six more Clark County District Court Judges for Family Court, ostensibly to relieve case backlog. Such request would include funding for the same number of Law Clerks, Judicial Executive Assistants, and Courtroom Deputy Marshals. Yet, during our investigation of our current Clark County District Court Judges, especially in Family Court, we discovered that numerous judges work only between 20 to 35 hours per week. So do their Marshals. Why do we the taxpayers have to hire more judges when numerous current judges don’t even appear to be working full time? On an annual average including salary and benefits this is what they make according to Transparent Nevada: Judges — $251,932, Law Clerks — $137,650, Judicial Executive Assistants — $100,000, and courtroom Marshals — $67,517. This means that annual salaries and benefits alone for each new department would total $557,099. Multiply that by six, and you’ve got an annual increase of $3,342,594 that taxpayers have to pay. We also learned from various sources that one family court judge in particular constantly has a 2-3 day work week. Here are the videos we made substantiating that (click onto video: 1) Judge Mathew Harter where are YOU? https://www.youtube.com/watch?v=bjBeeqBpgIs, 2) Clark County Family Court Judge Mathew Harter AGAIN is not on the bench https://www.youtube.com/watch?v=TNme3MMyYVA, 3) Clark County Family Court Judge Mathew Harter AGAIN is not a work. 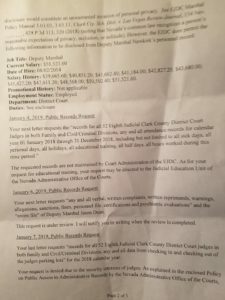 Call Judge Harter chambers https://www.youtube.com/watch?v=7KTqWtymKec, 4) Clark County Family Court Judge Mathew Harter still not at work. 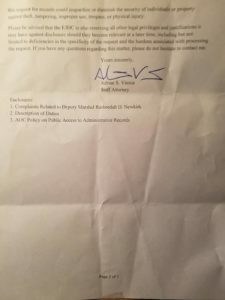 https://www.youtube.com/watch?v=AUFQAPATEUQ, 5) Clark County Family Court Judge Mathew “Half Day” Harter https://www.youtube.com/watch?v=C-UmXd17g1o, 6) Family Court Judge Mathew Harter half day Wednesday https://www.youtube.com/watch?v=ozwf6czTdlc, 7) Family Court Judge Mathew Harter is off the bench again https://www.youtube.com/watch?v=joSH3MBK5gY, ). In fact, we were so taken back that Judge Mathew Harter was constantly not on the bench, we contacted then Chief Judge Elizabeth Gonzalez chambers and through several sources we learned that she then instituted a policy of making District Court Judges account for their time in the courthouse. 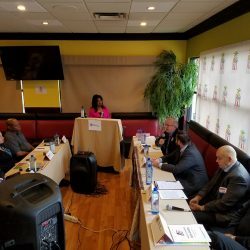 In an effort to further substantiate the hours that the District Court judges work, on January 4, 2019 Veterans In Politics International sought documents under Nevada’s Open Records Act. Here’s the link to our request: Freedom of Information Request https://veteransinpolitics.org/2019/01/freedom-of-information-request/). 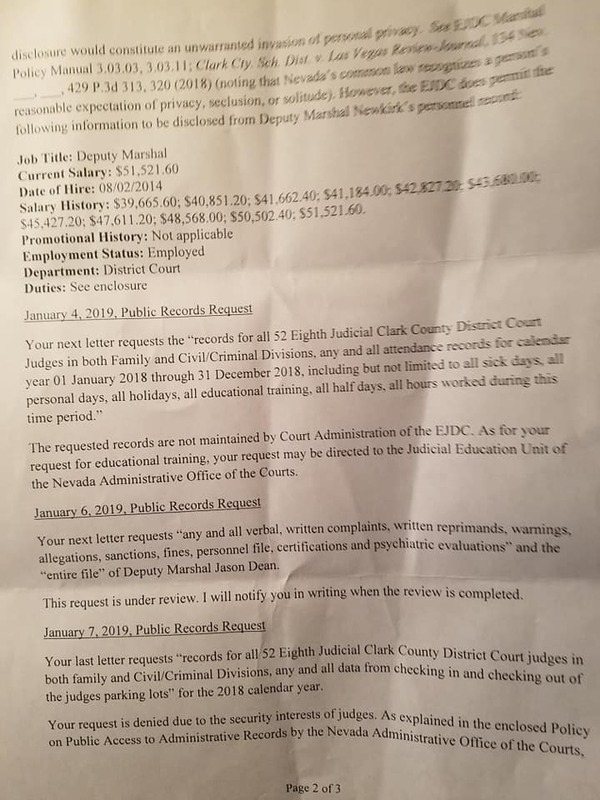 We requested an opportunity to inspect or obtain copies of public records for all 52 Eighth Judicial Clark County District Court Judges in both Family and Civil/Criminal Divisions, any and all attendance records for 2018, including all sick days, all personal days, all holidays, all educational training, all half days, all hours worked during this time period. In another request for documents, we also requested the judges’ parking lot key-card swipes to substantiate their claimed hours. We were also delighted when during Nevada’s recent Judicial Selection Committee hearings held on March 11th, 12th, and 13th of 2019, one of the newest commission members asked several applicants if they are willing to work a 40 hour work week because on a Friday afternoon at the RJC, all you can hear are “crickets”. 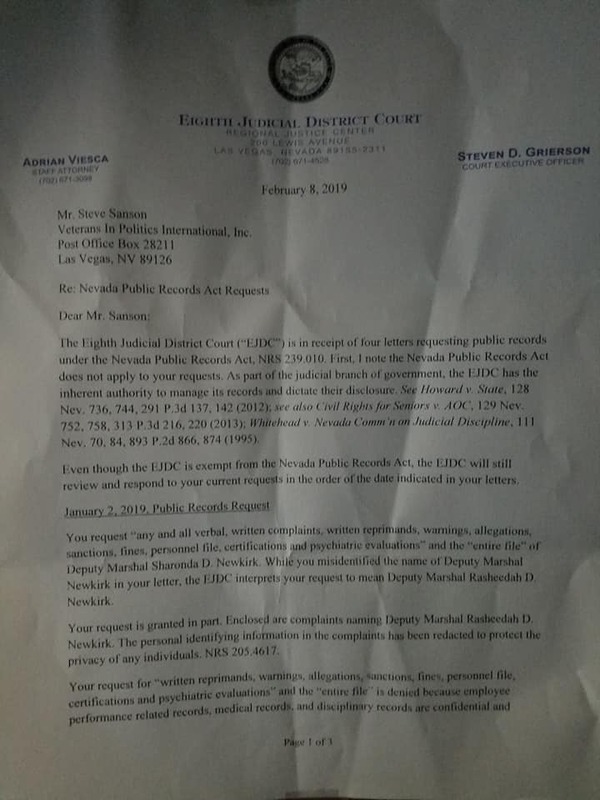 Unfortunately, on March 17th, 2019, Veterans In Politics International received and posted a letter from Clark County District Court Staff Attorney, Adrian Viesca, indicating that judges are not bound by Nevada’s Open Records laws and the Court would not therefore release the documents and information we requested. Adrian specifically cited “security concerns” over releasing the records. “Security concerns” over releasing PAST attendance records? We believe our request for documents was denied because we are trying to expose that numerous judges do not work a full 40 hour week; yet they rack up hundreds of thousands of dollars in taxpayer debt for salary and benefits each year. Some judges courtroom monitors that show their court calendar for that day haven’t worked for years, we feel that this is a deliberate attempt to confuse the public by not shown their caseload for that day. Nevada state judges are elected officials. The public has the right to know when/if their elected public officials are working and actually doing the job they are paid to do. See for example, In re Gazette FOIA Request, 222 W.Va 771 (2008); Hatfield v. Bush, 572 So.2d 588 (1990), and many more. When it comes to judges, there is little transparency and accountability. When you hear that it takes months for a judge to render a decision in a case, look into whether that judge is actually even working full time or just “coasting” for the pay and benefits while litigants’ lives are put on hold waiting for decisions. All 52 Clark County District Court seats will be up for re-election in January 2020. For those who are campaigning for re-election, ask them to prove their attendance records. For those campaigning for a vacant position, ask them to agree in advance that their future attendance records can be made public. Nevada deserves a working judiciary — one that does not unnecessarily delay justice and require the hiring of more judges just because they refuse to work the full-time job they were elected and are being paid to work. More Transparency and Oversight are needed on the bench! By Steve SansonIn Home - Featured, News, Press ReleaseTags clark county district court judges family, Do Judges work a full 40 hour work week?